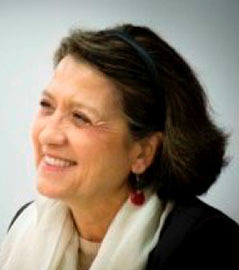 Margara Russotto is Professor of Latin American Literature and Culture. Born in Italy, she lived in Venezuela for more than forty years. A specialist in 20th century Latin American Literature (including Brazil, Spanish America and Caribbean with a comparative and multicultural perspective), her research and teaching interests also include Poetry and Women Writers. She has published several books on literary criticism, more than fifty articles, and various translations of Brazilian and Italian authors (Oswald de Andrade, Antonio Cândido, Cecília Meireles, Giuseppe Ungaretti, Claudio Magris, among others). She has collected and edited the poetry works of two important women writers from Venezuela (Antonia Palacios) and Uruguay (Martha Canfield). Professor Russotto is also an internationally known poet with several books published in Venezuela, Spain, Costa Rica and USA. She has also been on the jury of prestigious literary competitions, such as the “Premio Casa de las Américas” (Cuba) and “The Joseph T. Criscenti Best Article Prize” (NECLAS, Boston University). Several critical works about her poetry have been published in recent years. Professor Russotto’s PhD is from the Universidade de São Paulo, Doutorado em Teoria Literária e Literatura Comparada, 1987. Professor Russotto has a long history of relations with different international institutions. She has been Director and Committee member of MA and PhD dissertations not only at UMass Amherst, but also at the Universidad Central de Venezuela, Universitá di Firenze and Universidade Federal do Rio Grande do Sul, among others. She is also Editorial Advisor and Evaluator of various international journals, such as Letras Hispanas, (Texas State University), LEA – Lingue e Letterature d'Oriente e d'Occidente (Firenze University Press) and Amonline – Other modernities (University of Milano). She is a member of the Scientist Committee of the “Centro Studi Jorge Eielson," Universitá di Firenze. Professor Russotto came to UMass Amherst in 2001 with broad academic experience. At the Universidad Central de Venezuela, she was Director of the Graduate Program Maestría en Estudios Literarios and a full Professor of Literary Criticism, and she also served as Chair of the Department of Literary Theory. This year, Professor Russotto has focused her research on the theory, practice and pedagogical possibilities of Creative Writing in Spanish, resulting in the first experimental course of its kind at UMass Amherst. Other courses recently taught: The long poem in Latin America; Cuban Literature; Women and Culture; Spanish America Culture and Civilization; Latin American Poetry (from Modernismo to Vanguardias); Advanced Seminar on Clarice Lispector; among others. Currently, she is also working on a research project between UMass Amherst and the Universidad de Granada, tentatively titled Las poetas hispanoamericanas: identidades, feminismos, poéticas (siglos XIX-XXI). Sustentación del enigma; Cuatro ensayos sobre Clarice Lispector. Madrid: Ediciones Torremozas, 2013. La ansiedad autorial. Formación de la autoría femenina en América Latina: los textos autobiográficos (ed.). Caracas: FHE - Universidad Central de Venezuela y Editorial Equinoccio/Universidad Simón Bolívar, 2006. Tópicos de retórica femenina. San José: Editorial Universidad de Costa Rica, 2004 (2ª ed.). Recent articles have been published in Cuadernos Americanos (México), Canadian Journal of Latin American and Caribbean Studies (UK-Canada), Cuadernos de Literatura (Pontificia Universidad Javeriana, Colombia), La Habana Elegante (Cuba), Revista Iberoamericana (Pittsburgh), Hofstra Hispanic Review (New York), Imago Americae (Argentina). Recent chapters have been included in books published by the Universidad de Chile, Universitá di Verona, Universidad de los Andes, Universidade de Porto Alegre, among others. She has published several poetry books in Spanish, English and Italian. Her most recent creative work is Lombrosian Laboratory (ekphrastic poetry on sculptures). She was invited as a Writer in Residence by the Château de Lavigny, Résidence internationale d´écrivains et traducteurs, Switzerland. “Montserrat Ordóñez Prize” by the Latin American Studies Association (LASA, Colombian Section); Fulbright Foundation Fellowship; International Poetry Award “XI Bienal Literaria José Antonio Ramos Sucre” (Venezuela).